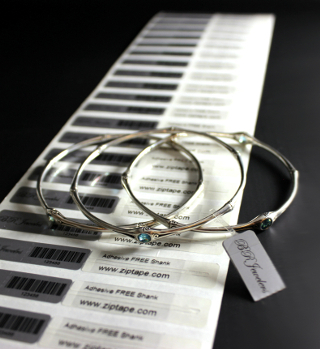 Our printable jewelry labels and tags are designed for a multitude of applications. As the name suggests, jewelry tag labels are primarily designed for labeling necklaces and rings, but they are available in so many different shapes and sizes that you can label just about anything. 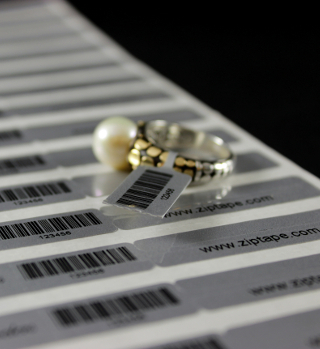 We carry standard jewelry pricing labels as well as barbell and rat-tail jewelry labels that allow you to hang a tag from your jewelry without the worry of leaving a sticky adhesive on your product. If you do not see the type of label you are looking for, please contact our friendly and knowledgeable customer service team to help you find what you need or provide you with a quote. These popular jewelry tags feature an adhesive free zone allowing you to attach a price-tag to your valuables without fear of leaving any sticky residue. Quickly label your jewelry with pricing or a custom logo by wrapping one of these full adhesive jewelry tags around your valuables.